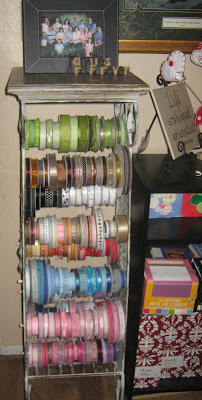 I have been SEARCHING for a better way to store all of my ribbon. I have had it in clear plastic totes but it is not easy to see or get to. I looked for ribbon holders that you could buy in stores but they were expensive and didn't hold very many spools! 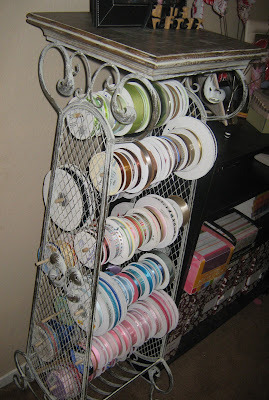 So I went on a quest to find something that could work in the space that I have and could hold a lot of spools. I went to the store Home Goods looking for something else and came across this beautiful tall table in the garden section of the store! I was so excited! I had some dowels and had my friend cut them for me (Thanks Paul!) and now I have a ribbon holder!!!! I really like it and it fits perfectly in the space that I wanted it! 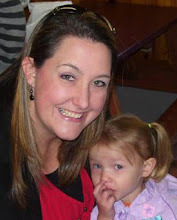 I am so excited about it that I have to share it on my blog! Have a organized day! So jealous!! I absolutely love it!! You are so creative!!! I love the ribbon holder! What a great idea and a great way to think out of the box! 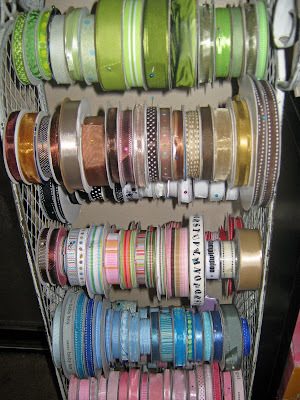 I am looking for something better to organize my ribbon too! Maybe I can find something similar!! Beautiful! Wow Jenny this just does the job perfectly, not only is it practical, i looks so pretty too. I love it! Great idea and it is so cute, too! Just found your blog surfing around the world....Wish you a great and kreative week.